Stress Reduction for Successful IVF: Run as Fast as You Can! 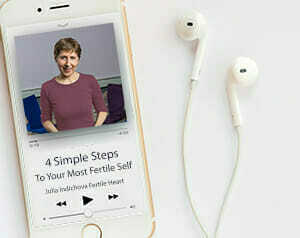 Hear this dear Fertile Heart Sisterhood: Nivedita, a 28 year old young woman in Andheri India, childless after four years of marriage is “stressed” after two failed IVF cycles. Then a benevolent Delhi based clinic’s psychologist counsels the young woman to be less “stressed” about her treatment and her infertility. She receives “stress reduction counseling,” her anxiety about fertility treatment subsides, she celebrates a successful IVF cycle and is now four months pregnant. A great success story! Or is it? I”m breathless with excitement about the arrival of Princess R’s IVF-conceived little miracle baby-boy, and cheering Morgan all the way as she prepares for her donor cycle, and grateful for the long list of Fertile Heart- In-Vitro-babies. I know the inner work their moms have done and I know they didn’t walk away from treatment worshipping technology. But can we really as a species afford co-creating a culture in which younger and younger women are resorting to technology to help them get pregnant? We really do need to shed a little light on these lame “stress reduction for successful IVF” stories. A happy open-eyed-fertile-Sunday to all! Julia — good post. I know you say that in FH we don’t use words like “stress” and “anxiety.” That has been hard for me to grasp. But I think I’m beginning to realize what you mean. When I feel “stress” or “anxiety” now, I really try to let those emotions move through me instead of simply pushing them down. It doesn’t always work but when it does I have a calm that washes over me and helps me to deal with whatever stressful situation is facing me. So de-stressing, as you say, for me is a bi-product of this work. Owning my feelings (even if they are Orphan based) has been difficult but very empowering. I need to more fully embrace this process that is uniquely ours and remember that it is a gift and that it is ok – even more than ok – for those of us this in this community who choose it and thankfully have it to choose. It is only around the failure I doubt the process. I feel no doubt or unresolved feelings in my heart for the son we have conceived. We are very clear together we are so grateful for the opportunity.